Heaven Knows, Mr. Allison (1957) is one of the 1001 classic movies you should see. 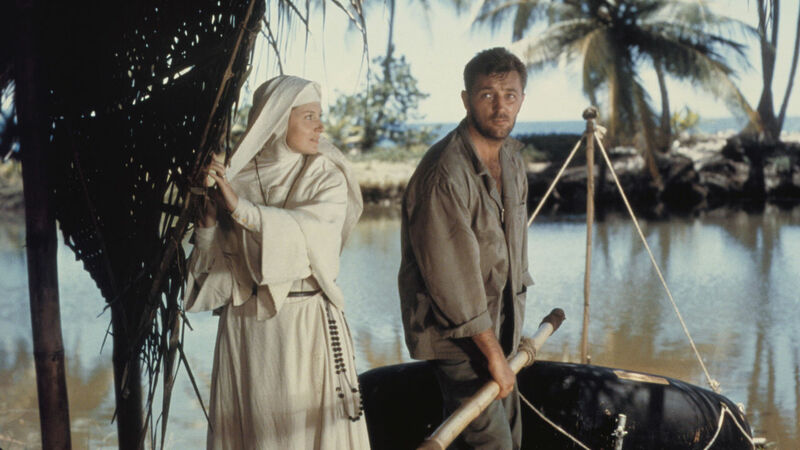 It stars Deborah Kerr and Robert Mitchum as a nun and Marine who are stranded on a remote island during World War II. Each week, I'm going to recommend a classic movie you should see (for the reasons behind the 1001 series and reviews of earlier films covered go here). This month I'm celebrating Robert Mitchum's centenary -- the iconic actor was born Aug. 6, 1917, in Bridgeport, Conn. -- by looking at four of his films. This week's selection is the World War II action film, Heaven Knows, Mr. Allison (1957). 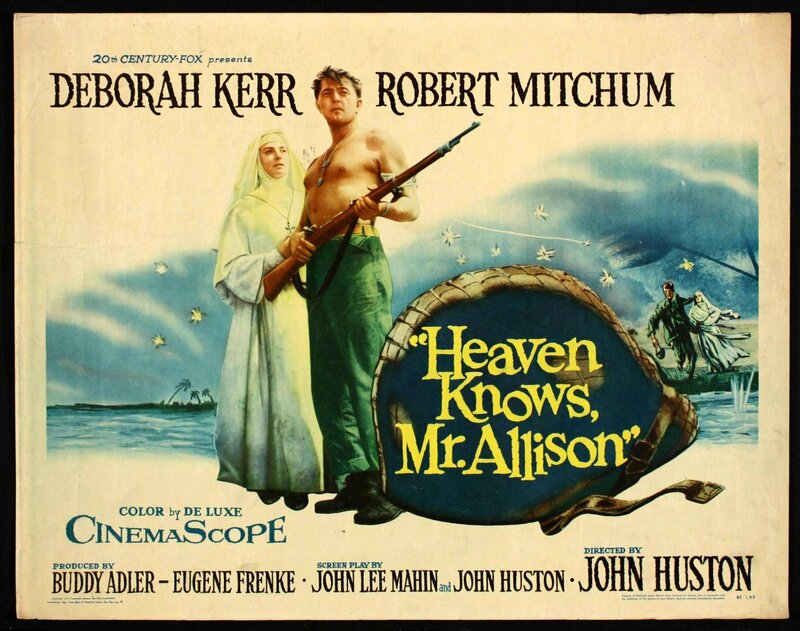 Heaven Know, Mr. Allison tells the story of Corporal Allison (Mitchum), a U.S. Marine who gets separated from his unit during World War II. Allison lands on a small South Pacific atoll that appears deserted until he runs into an Irish nun named Sister Angela (Deborah Kerr), who was stranded on the island while doing missionary work. At first, Allison and Sister Angela plan to leave on a raft, but, after the Japanese army sets up a base on the island, they are forced to scrape out a meager existence while hiding in a cave. Heaven Knows, Mr. Allison was adapted from a 1952 novel by Australian writer Charles Shaw. Producer Eugene Frenke acquired the rights to the novel and, after a series of false starts, he finally got a production deal with 20th Century Fox and director John Huston and stars Mitchum and Kerr headed out to Trinidad and Tobago for three months of location shooting. The result was a top box-office hit in 1957 that earned Academy Award nominations for Kerr and best adapted screenplay. Mitchum shot to stardom in the late forties because of the prominence of film noir -- see last week's selection, Out of the Past (1947) -- but throughout the 1950s, the actor's bread and butter was war films (both World War II and Korean War) and Westerns (more on that next week). In most of the war pictures, Mitchum uses his natural air of authority to play stoic warriors, but Heaven Knows, Mr. Allison gave the actor the opportunity to show a broad emotional range. Mr. Allison is certainly a tough action hero, but he is also a deeply vulnerable human being, and Mitchum effectively portrays his conflicting emotions when he falls hopelessly in love with a woman he can never marry. 1. Kerr and Mitchum. 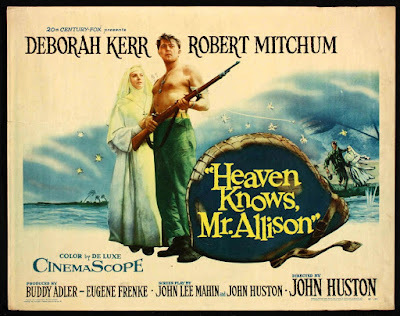 Heaven Knows, Mr. Allison was the first of four films the duo made together (the others are the family drama The Sundowners (1960), the romantic comedy The Grass Is Greener (1960), and the 1985 TV movie, Reunion at Fairborough). The pair, who shared a naughty sense of humor, became great friends, and their unique combination of reserved English rose and rough-and-ready American made for one of old Hollywood's most memorable onscreen teams. 2. Portrayal of Sister Angela. Shaw's novel featured an actual romance between Sister Angela and Allison, but old Hollywood censors promptly shut down any notion of impropriety between the nun and the marine. The issue was considered so sensitive that the censors were actually on hand to observe the filming, which caused the mischievous Kerr and Mitchum to ad-lib kissing scenes that obviously never made it into the film's final cut. 3. Location shooting. Frenke and Fox chose to make Heaven Knows, Mr. Allison in the West Indies rather than the South Pacific so the film could qualify for lucrative British government tax subsidies. The lush island of Tobago is one of the more memorable exotic locations in old Hollywood history (if, like me, you spent your childhood watching live-action Disney, you will immediately recognize Tobago from the 1960 version of The Swiss Family Robinson). 4. Action sequences. Huston anticipates survivalist film of the sixties and seventies like The Naked Prey (1965) and Jeremiah Johnson (1972) by placing Mitchum in several dialogue-free action sequences. Particularly impressive are Allison's arrival on the island, and his attempt to steal food from a Japanese fort. 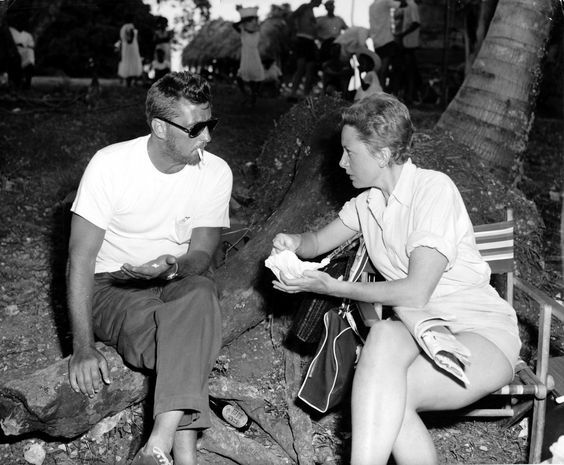 Robert Mitchum and Deborah Kerr chat on the set of Heaven Knows, Mr. Allison (1957). Other critics: Heaven Knows, Mr. Allison has an 88 percent fresh rating on Rotten Tomatoes and Leonard Maltin calls it a "marvelous, touching tale" with "solid performances by the stars" in a 3 star review for his Classic Movie Guide. Critics in 1957 had mixed opinions of the movie. The Variety critic praised the action sequences, but felt the nun/soldier pseudo-romance was a bit of a hackneyed plot point (most critics rightly pointed out the similarities between this film and Huston's 1951 romance, The African Queen). The ever-prudish Bosley Crowther of The New York Times devoted most of his review to praising the film for maintaining Sister Angela's purity, but he was also a sucker for the lush tropical locales that were "drenched in atmosphere." The Bottom Line: Heaven Knows, Mr. Allison isn't groundbreaking cinema. Instead, it's good old-fashioned entertainment from one of old Hollywood great directors and two of its greatest stars. Availability: Heaven Knows, Mr. Allison is available for streaming on Netflix Instant. It is also available on DVD and video on demand. Next week, I'll cover Mitchum as the troubled son of a wilderness family in director William Wellman's Western Tack of the Cat (1954).